Hasbro has tasked us here at TFV to give away an RPMs Devastator Showdown Track Set, so now is your chance to get one of these things for free! Entry is simple, merely visit the official giveaway thread and post what you are most excited to see in Hasbro’s recent Toy Fair presentation. So click here to enter the drawing. Drawing ends at 9pm on March 15th, 2010, so click here to enter the drawing now! The Saturn Awards – presented by the Academy of Science Fiction, Fantasy & Horror Films – has seen fit to honor Transformers: Revenge of the Fallen with a nomination for Best Science Fiction Film of 2009. It’s true. That’s ope of the top honors at the Saturn Awards. The winners will be announced at the 36th Annual Saturn Awards on June 24 in Burbank, California. You can read more about the Saturn Awards on the Academy’s website. Thanks to SydneyY and Sol Fury of TFW2005, here’s another translation of an interview with a member of the TakaraTomy staff involved with Transformers, Mr. Shogo Hasui. In this case, Mr. Hasui discusses the Japanese versions of Transformers Animated. 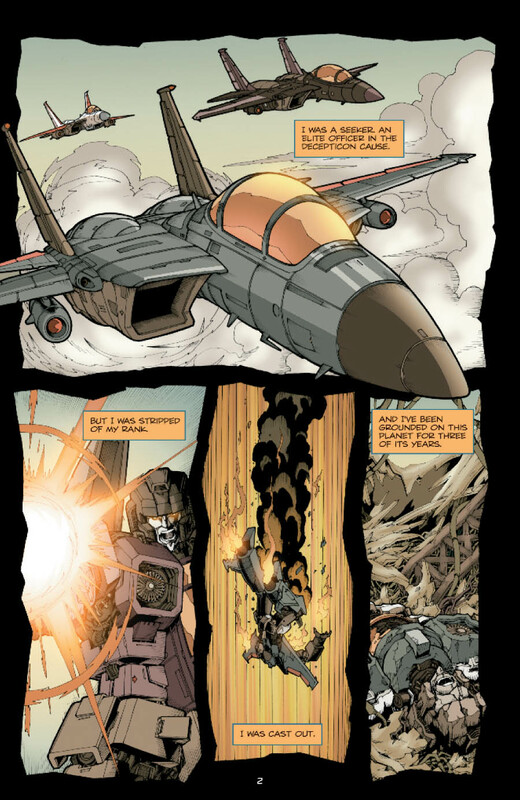 Tformers.com has posted a five page preview of “Last Stand of the Wreckers” issue two, due out this week! It’s 2pm EST, and Hasbro’s media day taking place for the New York Toy Fair show is going on right now. Hasbro no longer takes part in the Toy Fair main showroom, instead choosing to have their own private location a few blocks away. The day before Toy Fair starts, they invite fan sites and media to a slideshow presentation for their brands, and a walkthrough of their product showrooms. While TFV was invited this year, we couldn’t make it, but we’ll link to other coverage as it appears. TFW2005 has started adding photos. WFC Bumblebee, Power Core Combiners Bruticus & Superion! Yakface.com, a Star Wars site, is updating live pics from the slideshow presentation, including Transformers. Their site is a little slow from the traffic, but we can see that MP Grimlock will be a TRU exclusive. “Transformers Generations” seems to be the new Classics line, has a Straxus figure, named “Darkmount” on the slide. Tformers is live-updating info and a few very small video snippets from the Hasbro slideshow. They have a pic of Human Alliance Jazz. Unicron.com is updating live photos from the event on their blogspot account. ActionFigs has posted the Press Release with lots of new info. Discuss this event in the forums!